Director Martin Campbell, two timer James Bond director (Goldeneye and Casino Royale), reunites with actor Pierce Brosnan as Liam Hennessy, the grizzled politician/gangster and brings in Jackie Chan as Quan Ngoc Minh, a quiet grieving father hellbent on revenge. The Foreigner worked as an action flick, harkening back to films from the 90’s where the protagonist and antagonist are formidable opponents as equals. It also showed a side of Jackie Chan that we don’t usually get to see on the big screen. His dramatic chops, which he has, previously unseen due to typecasting for his trademark and brilliant physical comedy stunt work. Now that he’s aging, perhaps there is a limit to what he can do physically, or perhaps he just wanted to branch out into a strikingly strong performance here. Quan Ngoc Minh is an immigrant restaurant owner who seeks vengeance after his beloved daughter is killed in a shop explosion claimed by a neo-IRA terrorist group, “Authentic IRA”. When tracking the group who killed his daughter, he seeks the help of Liam Hennessy who works for the British government and has past ties with the IRA. Liam claims he cannot help and does not know who is behind the bombings. In his own attempt to track down the responsible parties, and limit the blowback to the government, he enlists the help of his nephew to track down the responsible parties. 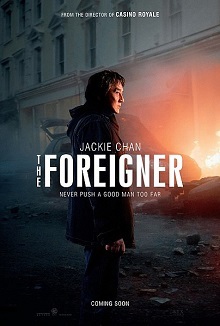 The Foreigner is adapted form Stephen Leather’s novel, The Chinaman, which explains why Quan is constantly referred to “The Chinaman” as almost a menacingly title which is dated and a blatantly offensive term. As the story progresses, the past catches up to Liam and Quan separately. What works for The Foreigner is there is time for story and character development. It doesn’t hurt that both actors come in strong and it isn’t non-stop action. The few brawls are thoughtful, well-crafted, brutal, and shot gorgeously. We still see Jackie getting hurt a few times which is expected, but nothing compared to his previous works. I will say that there are moments that feel a little disjointed in the film, where we are left with Liam’s character who is attempting to minimize bloodshed and ward off the attacks by Quan, who eventually ends up with a game of cat and mouse terrorizing Liam’s people from the woods nearby Liam’s stronghold getaway. A couple of times I had forgotten that Quan is still plotting behind the scenes because there is a division between screen time. The Foreigner ends up having a tight narrative carefully crafted by Campbell about two men on somewhat opposing sides, but neither of them are necessarily good or evil. They both live in the grey area that exists for most people and resort to the methodologies that get them the results they desire.